A young farmer has recently bought the grazing land that runs between Red Rock Road and the Western slopes of the Victoria Range. This is the land people cross to access all cliffs around Red Rock Creek (Red Rock, Band of Gypsies, Crag X, Far Pavilion). The previous owner allowed access across the land but the new owner does not have public liability insurance for that land and has requested people not cross the paddocks to get to the cliffs. Please do NOT cross the open paddocks here. We don't want to antagonise the farmer. If relations stay friendly it may be possible to re-negotiate access. Access should be by from either the southern or northern boundaries, depending on which is least inconvenient for the area being visited. Southern boundary : Walk along the dirt rd that turns east off Red Rocks Road just south of the paddocks. Follow the rough track for a few hundred metres and then skirt along the bush high up on the hill tracking under Eagle Rock. This would be the best way in for Crag X, The Shire etc. 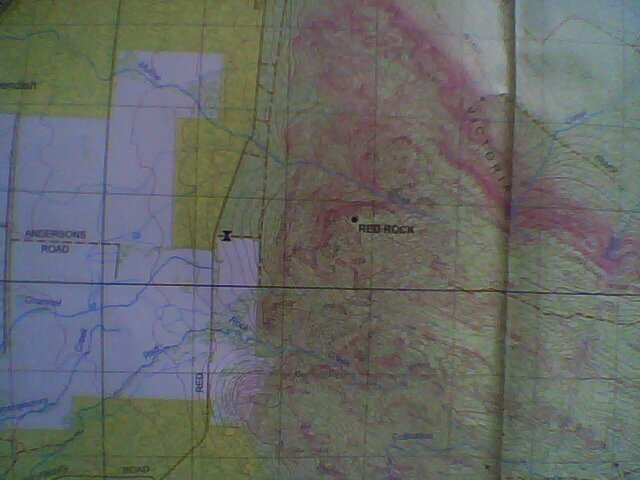 Northern Boundary : Follow the track leading up towards Mt Fox from Red Rock Road then the sandy track going south just east of the fence-line until under Red Rock. Probably the best approach to Red Rocks, Band of Gypsies etc. Thanks to Dave.k for the information. That plot of land was going to be my retirement home! James Mc and I were eyeing it off years ago, thought it was a very nice pad. Oh well, if the new owners ever put bits of it up for sale, let us know. I might get sick of newsouthwelsh sandstone choss one day and want to retire amongst real rock. I'm quite amazed that that land is private property? For 15 years I have been walking across that land to access Red Rocks in the assumption that it was private land reclaimed and added to the National Park. I certainly saw no evidence of farm equipment or domestic animals, and there is no fence between it and the National Park. Kangaroos and emus swarm over that land every evening. Guidebooks to the area have never mentioned the private property aspect. I always joked that it would be the very best land to own to build a dream house for a climber! I had no idea that it was actually possible to buy it!!! I would have put in a hefty bid if I knew. In recent years (since I have been away from Vic) I see that people have actually been driving across that land to park almost directly below the Red Rock pinnacles. The fence next to Red Rock Rd is half fallen down which is why they ca now drive across the grass lands. How about a retirement shack at one end of the paddock, some self-contained cabins up the other end amongst some trees as a little earner, and a climber's bunkhouse for the tightarse climber. The Vic Ranges were always a struggle to drive to from sMelbourne for a weekend, maybe knowing there is a bunkhouse, maybe a communal fire, and a hot shower on Sat Night... plus endless quality cliffs to explore within walking distance. >cliffs to explore within walking distance. Yeah but it'd make for good roasts on a Saturday night! 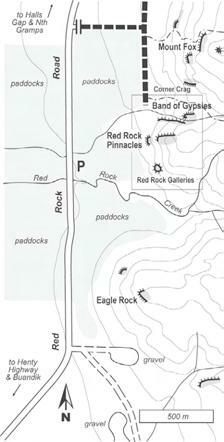 I snaffled this out of Michael Hampton's Red Rock Mini Guide. Could someone in the know add the access to one of the two maps? If you need a clearer version of the first one, let me know and I'll get a scan. Messy, but you get the idea. It's probably a sheep paddock Neil. Depending on the overlay, which is probably agricultural, it may be impossible to subdivide. Hi Neil, if you've been along Red Rock Rd this season, you'll see that all the paddocks on the Western side of the road (which are owned by the same farmer I think) are now ALL budding young tree plantations. Don't know if it's for timber/pulp or for carbon offset. He may do the same to the Eastern side paddocks, but for now I think it's just grazing land that he puts sheep out to pasture on for a few weeks a year. He lives in a Homestead nearby and grew up there, so I think there's no chance he is planning on building on the paddocks. FYI, to my knowledge all the fences that used to be knocked over and had drive-in access (like to Red Rocks) are now repaired and gated. But presumably he needs to rebuild all his fences before he can introduce sheep? There is certainly nothing remaining on the eastern edge up against the cliffs. Tree plantations have been there for a couple of years. Went in just in time to catch the collapse of the bluegum timber schemes. It doesn't take long to rebuild fences - a contractor will do it in nothing flat. Given that sheep are getting good prices at present it'll probably be worth his while to do that, especialliy given that so much other land is taken up with bluegums. >time to catch the collapse of the bluegum timber schemes. Sorry, I mean the paddock on the other side of the road from the Crag X paddock. That's new plantation this year. in most areas now you need 100 h (247 acres ) to be eligible to build on or sub divide into. I would have thought that if he was running stock it would be very unwise not to have public liability cover . The cost of which is the same for a few hectares as it is for a much larger operation. Presumably the land is not mortgaged as morgagees generally insist on cover of 10 to 30 million . I didn't realise it was on the market. Otherwise as SuperStu alluded, I'd have bought it. Met the previous farmer years ago. There are 29 messages in this topic.